The opioid epidemic has spawned numerous state efforts to develop strategies that involve law enforcement, public health, Medicaid, and other state agencies. 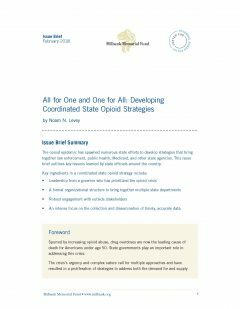 While each strategy on its own may be worthwhile, effectively coordinating these efforts will likely prove to be the key to reducing the number of families and communities damaged by opioid abuse. An intense focus on the collection and dissemination of timely, accurate data. We hope the insights in this issue brief will inform state leaders and others engaged in the work of combating this deadly epidemic.